Captain America: Civil War is certainly one of the best super hero movies ever made. Both box office returns and critical reception back that up. Although it is the third in the Captain America franchise, it has nearly all the Avengers in it. Captain America is the titular character, which normally denotes the hero, but Captain America was the villain of this movie. Let’s talk about how great a movie this was for a second, something we can all agree on, before we start getting into contentious matters. The movie has pulled in over a billion dollars thus far according to Box Office Mojo. So obviously it was popular. That’s not even including toys, posters, shirts or any merchandise. Nor does it include Blu-Ray and DVD sales. All the attention and praise is justified. The movie is great on two levels. It is great on the micro and macro level, the personal and the societal. It explores issues on both levels and does so fairly well. The film explores the personal in a very real and personal way. It does so with multiple characters. Utilizing the world of superheroes in order to explore small universal things in such a large way is a very Spider-Man move. And by Spider-Man move I am referring to the Sam Raime/Tobey Maquire franchise. Years on, whatever qualms Spider-Man fans have with the unquippy version, it’s hard to deny that the Spider-Man franchise changed what a superhero movie could be. Great as the original Superman and early Batman movies are, their focus was on the hero and the plot was that of the superhero against the supervillain. Spider-Man was more about the development of the person who was the hero. Not only that, but it explored what drove the villains and treated them like people. The other type of great superhero movie uses these extraordinary situations to explore not as much the choices a person makes, but society. This is the X-Men approach. Critics not familiar with the X-Men and the whole Professor X is MLK and Magneto is Malcolm X thing were pleasantly surprised by the weighty themes of the X-Men franchise. Naturally, all superhero movies, and perhaps all movies in general, say something about both individual issues and choices as well as societal issues and choices. But Captain America: Civil War is one that straddles both sides equally and with equally high stakes. It straddles both of these nearly perfectly, until possibly the very end, which will come up later but let’s first focus on why Captain America was the villain of his own movie. It’s important to point out first, before I call Captain America an accidental villain, that I’m talking only about the movie. The crux of the societal drama in the movie is the “Accords.” The Accords are the agreement which would bring the Avengers under the supervision of the United Nations. The comic book version of the Civil War plot involves another issue called the “Registration Act.” You might remember it from the X-Men franchise, which is owned by Fox, which is why no X-Men (except Quiksilver on loan) appear in Avengers movies despite being part of the comic book plot, Wolverine in particular, and is perhaps why they don’t use it in the Civil War movie. They may have also skipped it because it’s a whole can of worms that would be a lingering issue in the Marvel world for perhaps ever and they’re moving on to the Infinity Wars. The Accords wouldn’t necessarily impact the upcoming Dr. Strange movie, or Spiderman, or Captain Marvel, but the registration act would be a constant presence. Everyone who gained powers would have to deal with the issue. They may have also skipped it because without the X-Men, there’s really only a couple dozen people to register anyway and everyone knows who they are. At least to the best of the audience’s knowledge, there aren’t people with powers hiding out or spontaneously popping up. People with powers don’t appear to be hiding or going off the grid in this universe. Whatever the reason, the Accords are the issue here. Tony Stark wants to sign it. Captain America does not. Tony Stark is 100% correct about this issue and Captain America is 100% wrong. Not only does Captain America set an extremely dangerous precedent in the world but he does so, ironically, by effectively ignoring all the things that are America. In the abstract, the Avengers are a military/police organization. They use force to enforce the law and internationally accepted norms like not murdering people on a large scale. What the Accords proposes is that the UN would oversee the Avengers. This came up after the events of Age of Ultron where a city was destroyed in Sokova, which is why the Accords are also referred to as the Sokova Accords. But every MCU movie contains some civilian death or destruction. And if you consider the MCU, a significant amount of the damage that’s been done to the world is because of the Avengers, not just Stark’s inventions but the Hulk too and the mere existence of Thor making us susceptible to all forms of galactic terror. What is oversee though? Well the movie is light on those details but it appears that the UN would decide when to deploy the Avengers. They would also likely be made aware of, though not in control of necessarily, the more specific tactics and strategies they employ. Or at least that’s my assumption here. So Tony Stark wants to sign the Accords. Why? For two reasons. First, taking responsibility. The Avengers have caused harm to the world, and to eachother. They’ve harmed enemies, friends, and civilians. Stark seems to feel this would go a long way toward helping reduce the potential Avengers side effects by increasing coordination and also combining the resources of the Avengers and the UN to better defend the planet. And really, this isn’t just about civilian safety, or conventional military. This is not addressed but a situation could easily arise where the Avengers attempt to infiltrate some stronghold that the UN or the US government or some state has decided to blow up. Being on the same side and acting independently is all risk and no benefit. The second reason, and the one that seems more important, or at least equally important, to Tony is PR. If the Avengers go to save people on their own, and people die, then the world sees the Avengers stuck their nose in and messed up. If the UN deploys the Avengers and something goes wrong, then we all messed up. PR might not sound as important as coordinating to save the world but without the PR angle the world saving isn’t in the cards. The reason is because The Avengers cannot break the law. If they break the law, then they have to face the same consequences that everyone else faces. The fact that we watch their movies and root for them does not make them above the law in the universe they’re in. Remember the scene where they were coming to arrest Winter Soldier and then Captain America and Winter Soldier beat the crap out of everybody? Ya, that’s exactly what Tony is trying to avoid, the “PR” nightmare that is fighting the people for their own good in order to avoid the laws you feel are worth enforcing. Remember, we know the Avengers, the moviegoer, at least we think we do, but the Earth of MCU does not. And even knowing them, you can’t ever be sure Hulk won’t tear some civilian in half some day. But for a few dozen miracles orchestrated by the writer’s pen we would have already seen that. 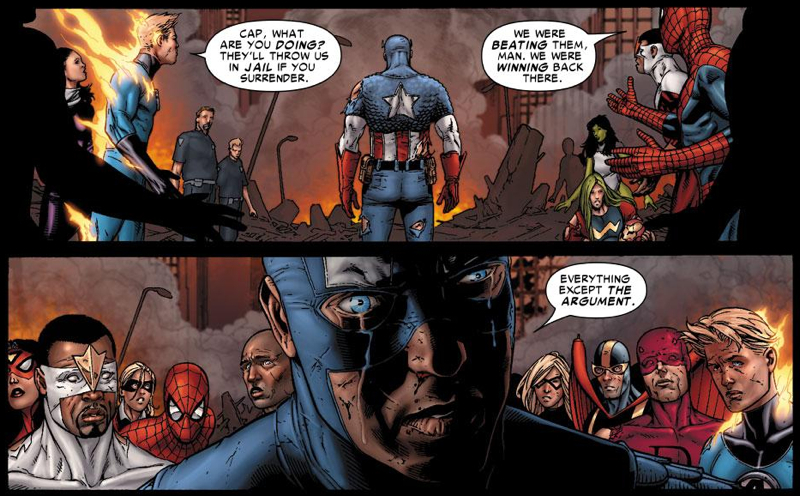 Now what is Captain America’s rationale for opposing the Accords? It’s difficult to say since he never really engages in talking about it. He engages in no diplomacy, no negotiation. He declares his position and is prepared to defend it with snarky comments and violence. But one reason at least is clear. He thinks Bucky is innocent and wants to keep his friend from facing his accusers. Based on what we’ve seen in the MCU he is correct that Bucky is innocent. He is absolutely right about this issue that impacts 1 person. Tony is right about the issue that impacts billions of people, and about Bucky. I’ll explain that last part shortly. The other reason for Cap, and this is assumed since Captain America really never explains his actions outside of he likes his friend and that corny letter he wrote Tony, is the events of the previous movie and his interactions with Hydra. It’s true that apparently Hydra infiltrated our democracy in Winter Soldier, and that has made him skeptical of democratic oversight. But again, he’s wrong about this, and I’ll explain that too. Tony is right that the Avengers are better off when coordinating with all the governments of the world. But Captain America seems to assume they’ll be subject to whatever the UN wants. He assumes they’ll be … soldiers, which for some reason Captain America, a guy who once volunteered to be a soldier and do exactly what he’s rejecting, rejects. Regardless of his new distaste for soldiering, it need not be like that. The Avengers have leverage. The Avengers could have negotiated any kind of Accord they wanted and submitted that to the UN. For example, they could have included a provision that no Avenger will be charged with a crime for any damage they do while deployed by the UN that did not clearly show intent. That’s reasonable, if not pretty obvious. But Cap just wanted to punch people. Tony is also right about the PR issue. It is only by the miracle of a sympathetic writer that Cap and Bucky did not kill or seriously injure any of the people they beat the tar out of coming to get Bucky. But there are laws. People are not allowed to create their own military force and use violent force in any country they choose for any reason they choose. Again, we can’t look at this from our movie seats but from the perspec tive of someone like you in the MCU. So laws exist, you just cannot use force without permission, and the Avengers do that. When confronted with it, Cap resisted with force. All of these are crimes. So what’s next? What’s next is people get hurt. Cap has his pride, but so too do non-super people, and it’s difficult to assume the world will submit to the vigilante whims of a group of super powered strangers because those strangers will beat them up if they don’t. The inevitable conclusion of Captain America’s irresponsibility is war. And but for Tony Stark covering for Captain America, the Avengers and the people of planet Earth would be at war. Tony Stark alone is keeping the planet from falling apart. The level headed responsible behavior of Tony Stark is keeping this all together. Weird. Captain America is taking advantage of his own strength to be above the laws of people, and he’s taking advantage of Tony’s desire to prevent people from getting hurt. Essentially, Captain America is willing to let this turn into an all out war between regular and super people. Captain America is willing to let people get hurt, and Tony is not. That is why Captain America came out victorious, apparently, in the end. It’s because, in true Machiavellian style, he took advantage of people with good motives and his own raw strength. But remember Cap had some justifications too. And they’re wrong. The first justification is that Bucky is innocent. And later in the movie when it became clear he was brainwashed all the characters, predictably, seemed to interpret this as proving Captain America right. When it actually does the opposite. If Captain America would have let Bucky get arrested and face an investigation and trial, he would have been let out before it even got to trial. The evidence Tony was made aware of was gathered independent of any of the actions of Captain America. So Captain America went to war to keep his friend from facing a trial that would have found him innocent anyway. The entirety of the events of Civil War were completely unnecessary, if Captain America had just been … American. And that’s ultimately why Captain America is the villain of his own movie. He fights against everything that is America. He fights against everyone accused facing trial. He fights against democratic oversight. In the Constitution, half the Bill of Rights regards trials and evidence. These principles regarding trial emerged, like all the principles in the Constitution, from a world following feudalism, where one really powerful guy decided everything for everyone. If you knew the King or were the King, you didn’t have to face justice. If you weren’t, then you were subject to the King’s decisions. Captain has made himself the King. Another important principle in the Constitution is that congress is meant to declare wars and the president is the commander in chief. This is democratic oversight. The notion that there can be a military force in the world acting as it pleases is absurd. It is completely unreasonable to believe the world, least of all America, would agree to allow an extremely powerful military organization to act at will and be above any consequence or oversight. Now, recall Cap’s experience with Hydra infiltrating the US government. How many times in history has a democratic nation been completely infiltrated covertly by an outside military force? The answer is never. So Cap’s experiences are not at all statistically common. The choice is between democracy or no democracy. Based on all statistical evidence, and verified over and over, democratic countries are much more peaceful and much less subject to corruption than all other forms of government. That’s not to say there’s never been a great King. But what about his kid? Or the next one?You’re basically picking a person at random. If you keep picking random people you eventually get someone crazy or evil. That’s what democracy is based on, the assumption that 1 person could be good or bad or smart or stupid. But most people, together, are on average decent and reasonable. A completely insane person can be born much more easily than voted for. Just look at how humankind progressed through the middle ages and again following the enlightenment and it’s pretty clear democracy is more effective than letting whoever happens to be powerful control everything. So yes, we as moviegoers understand where Cap is coming from. We even trust him to be a good guy. Maybe he could run an independent military organization and not have it result in disaster, or not use it for his own gain. But Cap isn’t immortal and this is a precedent. What about the next person to take over the secret Avengers? Or the next? Or the next? Now we’re dealing with a King situation again, where one person chosen by non-democratic means gets an extraordinary amount of power. Eventually, inevitably, someone bad would use the Avengers to do harm. And with no oversight or coordination there would be no way to know about it or to prepare for it. Furthermore, what’s to stop some other group of less heroic super people from forming their own group? All you have to do is be strong enough to beat up soldiers and police and then the laws don’t have to apply to you as long as you believe in what you’re doing. An odd part of the movie is when Captain America writes a letter to Tony at the end of the film and provides a less selfish rationale to Tony, he has faith in the “individual.” By the individual, he apparently means himself. Because the rest of us are individuals too and he did not have faith in us to work with him. He did not have faith in us to provide a fair trial. He did not have faith in us to find the truth of the matter or to be participants in protecting ourselves. Captain America is the villain of his own movie because he used violence, as a first option, and took advantage of responsible people in order to, ironically, avoid many of the things that are what America is. This is not to say Captain America is a bad person. He’s not. The MCU is loaded with great heroes but outside of Loki it lacks great villains. Captain America is the greatest villain of them all, at least at the moment, because we rooted for him. Because we understand exactly why he did what he did. Walter White had pure motives too. In the comics Tony Stark uses some underhanded tactics and ultimately wins because Captain America allows him. He does this because he cannot abide continued suffering. The plot in the comics ends when (SPOILER ALERT) Captain America surveys the destruction and decides to give up. Some heroes pleaded with him because they were winning. Surrounded by the destruction the war had brought, Cap says with tears, “Everything but the argument.” I won’t spoil any more. In the movie, Tony Stark loses to Captain America, precisely because when it got to the point that people were really going to start suffering, Tony Stark was the one who swallowed his pride, and even what he thought was right, to save people just as Cap had done in the comics. This is why at the end when Captain America is pleading with Tony to understand that Bucky didn’t know what he was doing and Tony said, “I don’t care.” A part of me agreed with him. Not because of Tony’s personal journey. Which, wow, but this is strictly about the societal level. Part of me agreed because Bucky is one guy. And so much damage had been done over one guy. Why? Because he was Captain America’s friend. One Bucky, innocent or guilty, is not worth that much damage. Tony Stark is a great character but not one I necessarily thought of as a responsible adult. He was not the character I related to most in the MCU. I did not anticipate being on his side but when viewed on an objective, societal, sustainable level, there’s just no way a quasi-military organization can operate internationally with impunity without permission of the countries they enter or any form of civilian or democratic oversight while essentially determining on their own whether they’ve committed crimes or not. And why do they have this special privilege? Because they’re strong enough to beat up anyone who says different. That just cannot work. And that’s where the movie kind of falters just a little bit. Throughout the movie it explores all these personal and societal issues seamlessly until the very end. The very end is strictly personal. Tony and Cap are buddies. Yay. But every second Captain is out there illegally is a dangerous precedent lending legitimacy to the notion that everyone who feels their own intentions are pure and are strong enough to act on them need not concern themselves with laws or the will of people. How many villains give their little speech in front of a death ray explaining how what they’re doing is somehow benefiting the world or is justice? Stalin and Hitler did not think of themselves as evil. Obviously Cap is not evil. But he’s a villain because he opens up a space where evil might go, where might makes right, and even when you’re good that’s wrong.